Pete Lumbis did an amazing job presenting Cumulus at #NFD17 and I highly recommend you check it out. Cumulus is nothing new to the networking world as they have been doing some very cool things over the past several years. However, I feel that we are seeing their adoption more prevelant than before. There are several reasons for this in my belief. Foremost I feel the main driver for this adoption is that more and more businesses are willing to embrace non big vendor networking because of a multitude of reasons. And yet another reason is that more and more networking engineers are becoming more familiar with the Linux CLI and automation. For those of you not familiar with Cumulus, Cumulus is based on Debian Linux from a core OS perspective. They obviously have some super secret sauce that they lay down but for the most part they utilize various Open Source solutions. One of which originated from Quagga is Free Range Routing (FRR). Now if you have never had the experience of working with Quagga or FRR you are definitely missing out. I have had the privilege of working with Quagga in large scale multi-datacenter deployments using BGP. And I must say it works very very well. Now what Cumulus has done from a CLI perspective is a thing of beauty. 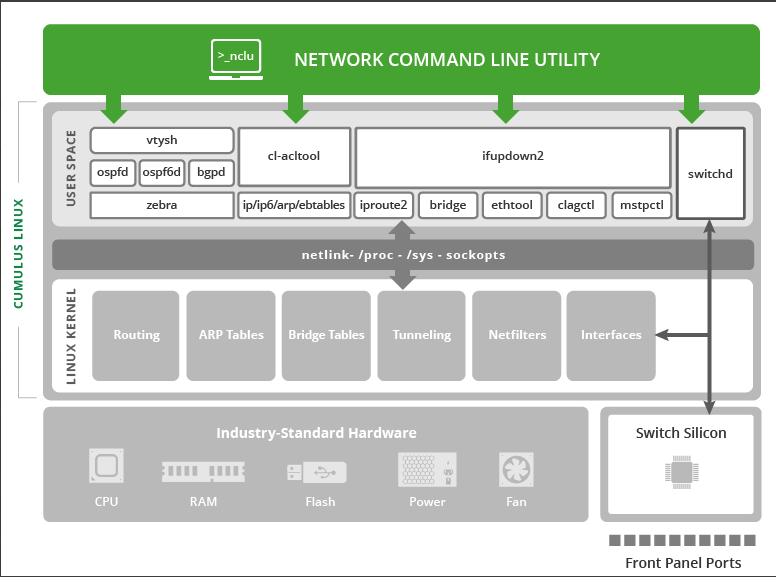 They have accounted for traditional network engineers to still use familiar CLI commands which translate into Linux primitives without them needing to understand Linux CLI commands. But at the same time, they leave the traditional Linux environment as is allowing for those familiar with Linux to manage the OS as they normally would. For more info on Cumulus CLI utility head over to Network command line utility (NCLU). When it comes to automation, because Cumulus is just a Debian Linux OS, we can easily automate the switch using any of our preferred configuration management tools. Because of this, we are not at the liberty of say an Ansible module to be developed in order for us to manage a Cumulus switch. This is very powerful to say the least. The other aspect around automation is that Cumulus provides Cumulus VX which is a virtual appliance which can be spun up in a multitude of ways. With this ability available to us, we can easily mock up deployments and get our automation developed and tested prior to configuring our production environment. I have only touched on a few points in this post that makes Cumulus a compelling solution but I can ensure you that they are for real. I highly recommend you give them a look and see for yourself just how cool their solution really is. DISCLAIMER: I have been invited to Network Field Day 17 by Gestalt IT who paid for travel, hotel, meals and transportation. I did not receive any compensation to attend NFD and I am under no obligation whatsover to write any content related to NFD. The contents of these blog posts represent my personal opinions about the products and solutions presented during NFD17.